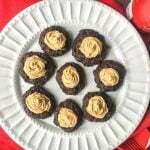 These low carb chocolate peanut butter cookies make for a delicious low carb dessert or treat for the holidays. Each cookies has only 1.2g net carbs! To make the cookie base. Add all the ingredients for the cookie base into a mixing bowl. Cream the ingredients together to form a dough. Line a cookie sheet with parchment paper and then spoon out the dough. Bake for 12 minutes and as soon as they come out of the oven, press your thumb lightly in the center of each one to make an indentation for the icing. Set aside and cool completely before adding icing. Add butter and sugar to a mixing bowl and beat on high for a minute or two. Add in the peanut butter and almond milk and beat once more until well incorporated. Pipe peanut butter icing onto the cookies. I like to refrigerate mine to last longer. Makes roughly 1 1/2 cup icing.